After this past weekend I can happily say that our house does not have any more yucky muddy brown cabinets. The doors and trim still have that dreadful color on them, but their days are numbered as well. 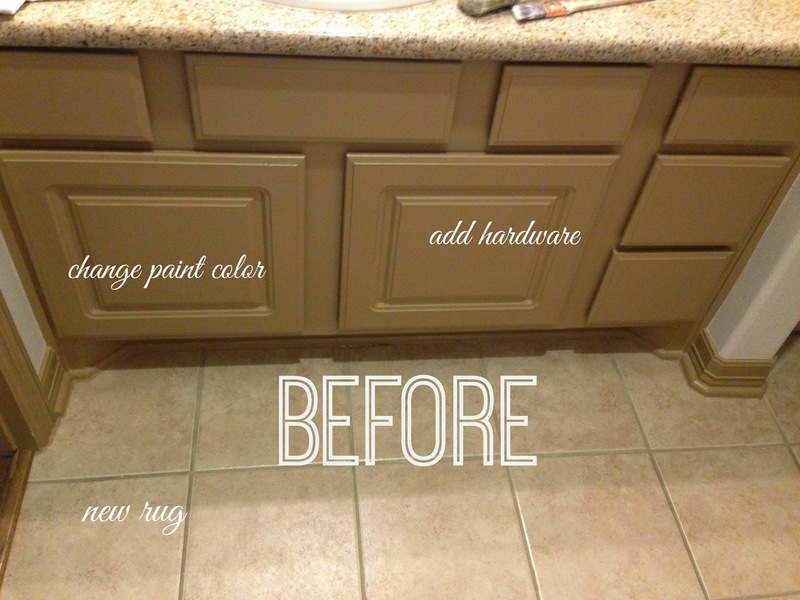 We gave our downstairs bathroom cabinets a little DIY makeover and wish we would have tackled this project sooner, especially considering what an easy transformation this has been. First we had to change the paint color and we used Annie Sloan's Chalk Paint in Pure White. It's just easy and quick to use. Plus I don't mind the finish of this paint. Next we added hardware to the cabinets. I really wanted a brushed gold finish but wasn't ready to replace the faucets & light fixtures. Plus that would have involved a special order and it wasn't worth the wait for me. When I get my mind set on doing a project early completion is my number one priority with such a small makeover. Target to the rescue for this hardware! I kept the same rug that I found at Homegoods awhile ago. Don't mind the blurry picture but love this modern update that took us minimal time and money! I thought we might be finished but after thinking about it I think the walls still need a little something. This could be a challenge with our textured walls that I love dislike so much. Wallpaper would be fun but would be way too much work or some sort of pattern. I'm thinking bold...maybe thick, black horizontal stripes? Something like this perhaps? Charity, what an incredible new color! I love white paint-- it can really cheer up a space!! WOW! What a huge change! Beautifully done. I wish I more skills like this. Where on earth do you find the time to do DIY like this when you have kids?! Ooh, paint made such a huge difference. And the new hardware is delicious! :) Love your new rug too. Long live Chevron! This looks so great! It really brightened everything up. I think stripes would be amazing.